The list goes on. There are loads of dictionaries online: here, here, here, etc. You can think of it as like Pig Latin, except much harder to parse, and featuring lots of foreign words too to make things difficult. For example pergi [= to go] -> ongul must come from Javanese or some other language. There’s not a lot of information available online on the history of boso walikan, but what I can find alleges that boso walikan emerged in the 1940s, perhaps as a kind of code language for revolutionaries. I’d love to know if there’s anything more substantial to read. 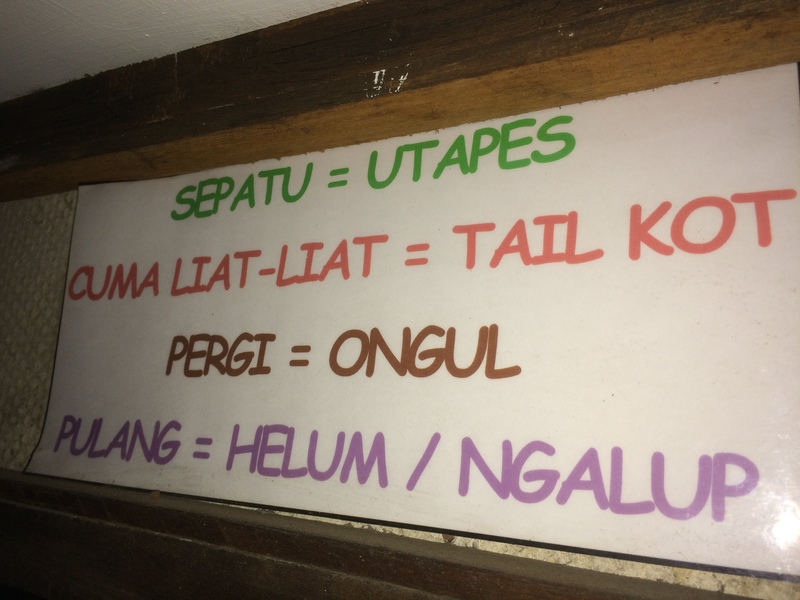 And yes, the Ngalam in the name Warung Ngalam is Malang, backwards. There is a fascinating linguistic dimension to this as well: the morphosyntactic constraints on word formation. For example, affixes are not included in the reversal. Moreover, syllable-shaping rules continue to operate. cina [= Chinese] -> onit, not *onic. Fuller discussions can be found here and here. The latter seems to be exactly on point, but I can’t find the full text. All of this is fascinating for the casual linguist. Even more fascinating, though, are other playful languages found in Indonesia, such as the Yogyakarta version of boso walikan based on inversion of syllabic roots in the Sanskrit-based Javanese alphabet (hanacaraka), such that matamu [= my eyes] -> dagadu. Or the Jakarta version that just inserts -ok- into words, so bapak [= father] -> bokap (the local shizzle).